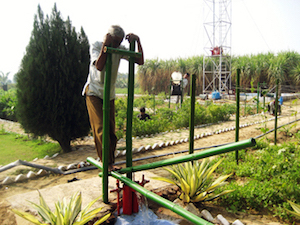 The Treadle Pump is a foot operated water lifting device for easy irrigation of small holder plots of land. A treadle pump can be used by all members of a farming family to irrigate crops. The user stands on two treadles, usually made of bamboo, and pedals them. This light exercise, similar to using a step machine, operates two metal pump-cylinders which are connected to a tube-well, or to a surface level pond. The tube-well consists of robust, flexible plastic, sunk into the ground until it reaches an aquifer. Before first use, water is poured into the cylinders to ‘prime’ the pump. When the user pedals, water is lifted up onto the field, or into a pond or irrigation canal. The pedalling action is easily mastered and not strenuous, so that anyone in the family can take a turn at irrigating the fields. Typically the household will operate a pump for between two and eight hours per day, often in the early morning or evening when the weather is cool. Land augmenting : For the poor farmers constrained by the small size of the landholdings, treadle pump technology acts as a land augmenting intervention. With the use of Treadle Pump the farmers can cultivate all the year round thus increasing their cropping intensity to 200-300%. Easy and productive : The Treadle pump is easier to use and is more productive than a variety of traditional manual irrigation devices. Its output is in the range of 4000-4500 litres/hour with a lift of 4-7 m.
TUV Nord has verified greenhouse gas savings from avoided diesel as 0.477 tonnes/year CO2 per pump. IEDI does not sell equipment directly to farmers but rather is responsible for setting up supply chains in rural areas, marketing the KB Treadle Pump, providing quality control of the supply chain, and the training of manufacturers, dealers and installation mechanics. IEDI facilitates the sale of different models of the treadle pump to small and marginal farm families in the eastern zone of India. Since inception in 1991, they have ensured the adoption of around 750,000 treadle pumps by small holder farm families. A number of assessment and socio-economic impact studies carried out in different regions of program implementation in India, have captured the changing roles of women and altered gender relations with the use of technology. Women have reported improved sense of ownership, confidence, and an increased ability to provide for the families nutritional needs besides the new acquired knowledge and new skills like proper crop spacing, fertilizer application, disease and control. The tribal women have shifted their roles from being wage laborers to independent farmers with keen and vigorous farming interests and increased time flexibilities.